The 2017 Dodge Ram 1500 is a full-size pickup truck that delivers substantial towing power, luxurious passenger accommodations, and impressive safety. 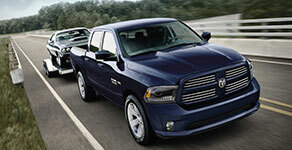 Choose from a number of configurations for the Ram 1500 that suits your needs. Engine options include a turbodiesel V6 – a rarity in this segment. Inside, the Ram 1500 is spacious and refined, with upscale features like stylish leather upholstery and dual-zone automatic climate control. High-tech safety gear provides world-class protection. Test-drive the 2017 Dodge Ram 1500 for outstanding power. Choose from a range of engine options for the performance you crave. We like the 5.7-liter V8, which generates 395 horsepower and 410 pound-feet of torque, giving you the heft you need to tow max loads of 10,640 pounds. The EcoDiesel engine is another excellent option. This turbocharged 3.0-liter diesel V6 delivers 240 horsepower and 420 pound-feet of torque. In addition to providing seriously rugged power, the turbodiesel engine offers impressive fuel economy, earning up to 21 city/29 highway mpg. Use this engine to tow up to 9,210 pounds. On the road, the 2017 Dodge Ram 1500 offers a refined, comfortable ride. It outclasses competitors with its adjustable air suspension, which glides over bumps in the road as if they weren’t even there. The eight-speed automatic transmission provides smooth, seamless gearshifts. When you’re towing heavy loads, it does an excellent job selecting the appropriate gear for maximum performance. The modern Dodge Ram 1500 provides excellent passenger protection. The Insurance Institute for Highway Safety gave the 2017 Ram 1500 its top score of “Good.” In government crash tests, the Ram 1500 earned a perfect five-star rating for total side-crash protection. The Ram’s rearview camera helps you back out of unfamiliar driveways without a hitch. The fully integrated trailer-brake controller helps you maintain impressive control over heavy loads. The Uconnect Access emergency telematics system helps you out of a bind with stolen vehicle tracking and an SOS button. 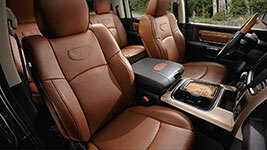 Inside, the Dodge Ram 1500 cabin is the finest in the segment. It delivers impressive luxury and modern comfort features. High-end leather upholstery and handsome wood trim gives the cabin an air of refinement. Heated and ventilated front seats ward off uncomfortable weather for long-term comfort. LED interior accent lighting gives the cabin a friendly glow after dark. The central Uconnect system keeps you connected, with features that include smartphone integration and turn-by-turn navigation. The Ram’s mobile Wi-Fi hotspot gives you the ability to surf the Web from anywhere. 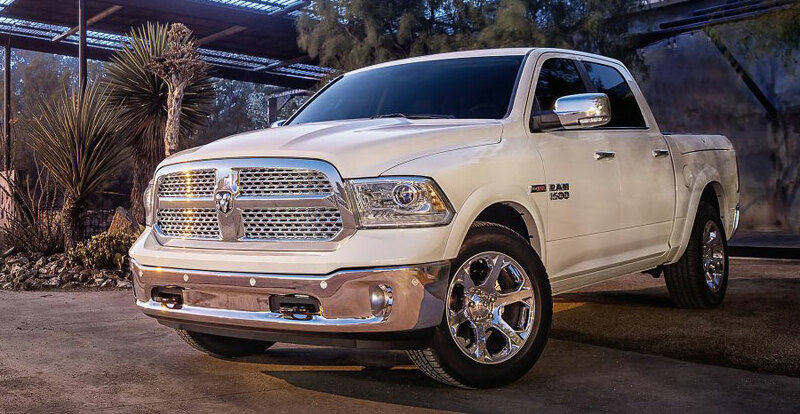 When you crave superlative style and luxury, check out the Ram 1500 Limited. This model offers exclusive leather upholstery, taking passenger comfort to new heights. The self-leveling air suspension provides a silky smooth ride, even over broken pavement. Cruise rugged terrain in style. Cruise around town without making a wrong turn. Enjoy best-in-class passenger interior comfort and support. There’s no better workhorse than the 2017 Ram 1500. To combine towing and hauling power with excellent passenger comfort, choose the 2017 Dodge Ram 1500. 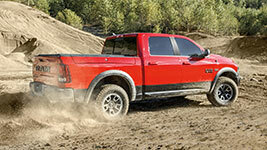 In addition to moving heavy workloads, the Ram 1500 supplies impressive off-road performance. 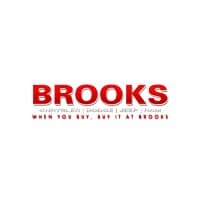 Choose from a range of rugged powertrains for the capabilities you crave. Inside, the Ram 1500 is stylish and refined. High-tech infotainment gear, like the Wi-Fi hotspot, keeps you connected to the outside world.